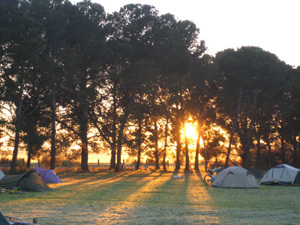 I jumped off the Bike SA coach in sunny Moonta, set up my camp and got organised for the first day's ride. After a quick lunch and an even quicker riders' briefing, it was time to head off. Luckily for me, our first day wasn't too arduous. We rode a triangular route which initially headed east from Moonta and took us to a couple of localities, the existence of which I'd never previously been aware - Agery and Cunliffe - before arriving back at camp a couple of hours later. It was a fairly flat 47 kilometres, and wind wasn't really a factor. It didn't particularly hurt, which was a relief. The distance itself, though, was more than I'd ridden previously in 2012 so I was satisfied that I'd made it without tiring. The evening was the time to reacquaint with old friends, and the Bike SA evening routine. I had a substantial feed, a couple of reds, and crossed my fingers in the hope that the next few days would be OK. It's colourless, (usually) odourless and tasteless. Depending on its direction, it can be of great assistance or it can smash you to pieces. Wind. 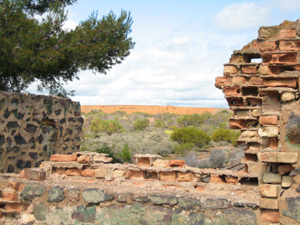 On Sunday the ride took us to Kadina and then on to Wallaroo. It was a pleasant novelty to leave camp without having to pack up. The route to Kadina was fast, the strong breeze pushed us all the way there, but as soon as we turned for Wallaroo and Moonta everything changed. The wind was right at us, and the long, straight stretch from Wallaroo to Moonta Bay was hideous. Exhausting. Partly because I was out of condition, but mainly because the wind was foul. The 4WD that missed me by centimetres didn't do much for my opinion of tank-driving dunderheads either. Anyhow, for the bulk of the ride I just tucked in behind my mate and cursed all the way home. Happy days indeed. I spent the afternoon recovering from a precarious position. I felt pretty bashed up. The miniature train ride around the mine helped a little, as did the restorative 'brown champagnes' at the Royal Hotel. I'd slept really well so I was about as fresh as I could be for Day Three. I rose, washed, packed and ate with boundless efficiency. I was expecting a pretty tough day, which was likely to compound my feelings of soreness. It was a cool, cloudy day which probably suited us for the early push out to morning tea. The leg to lunch at Bute was pretty flat, and pretty fast. As it turned out, the main part of the day was more of a solid grind than a series of punishing climbs. After a couple of hours of gradual climbing it was a great relief to hit the 10 per cent descent into Snowtown. We camped at the school, and walked into town. Sherrilee and Flash the dog greeted us as we walked into the hotel. As I replenished my lost fluids I gazed out of the window. Even in a sleepy town, gazing out of the window is a better option than watching daytime TV on the big-screen. I could see two people performing some kind of 'show', larking about in a barrel in front of that building, inviting folks to take photographs. Not sure if they were locals or blow-ins. They probably thought they were being cutting-edge and funny, but it just looked boring and more than a little sad. Dinner was one of those lovely community affairs, held in the Town Hall. The food, drink and friendship were all top-notch. Thank you, good folk of Snowtown. We walked back to camp under one of those moonless, starry, country skies that never fails to remind me of my insignificance. Truly beautiful. Despite the cool night, I slept well. I got up at 6.00 and was surprised to see a healthy covering of ice on the outside of the tent. It was an extremely cold morning. I was tempted to crawl back into my safe haven but the clear blue sky was promising. Breakfast was back at the Town Hall, which added an extra dimension to the morning's preparations. A bit more to-ing and fro-ing. I left my shoes outside to dry out/warm up in the morning sun. The ride to Brinkworth was slightly uphill and slightly into the wind, so it served as a decent warm up for the day. One of locals came down for a chat, resplendent astride her three-wheeled bicycle. The next section was a solid climb, and my poor mountain bike and I laboured along the long, upwardly mobile route. About 20 kilometers outside of Clare things started to undulate, which provided the odd moment of relief. It was a beautiful spring day, and the scenery was lovely - blue, green and yellow. The penultimate section was another big climb up Barinia Road, a bit of a gut-buster, before we turned right and headed into town along the extension of the Riesling Trail. Lunch at the fitness club was all very pleasant, as was our afternoon spent wandering around the town. After dinner, Ray and I sought assent from Bike SA high command to deviate from the planned bitumen course and ride the Mawson Trail between Clare and Burra. Green light! As planned, we rode the Mawson Trail rather than the established bitumen route on Day Five. And what a brilliant ride it was. Initially overcast and rainy, the day's conditions improved as the hours passed. From the moment we turned onto Angus Court Road, I was filled with happiness. I've ridden this leg about half-a-dozen times in the past, but always in the autumn. To do it at this time of year was something a little different. 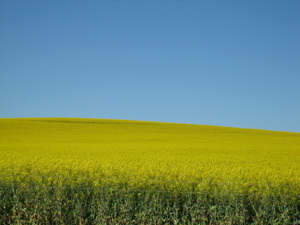 The canola fields provided an impressive backdrop to Camel Hump. We didn't stay long at the top of the climb as it was a little fresh. It is fairly flat from there to Burra, but there a couple of pretty thick climbs and some joyous freewheeling sections too. 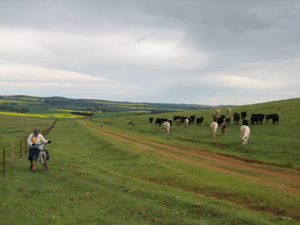 We got buzzed by magpies, saw kangaroos, felt a few spots of rain, encountered cows on the trail, waited while sheep were led from one field to another, and we had to get over a couple of electric fences. Ray took a tumble in the mud, just for fun. All in a day's work, really. We were fortunate with the wind, which was across us at worst. The roadies' route meant that they had to endure a tough slog into it. Gotta love those mountain bikes. The Burra Hotel was pleased to see us. I didn't do much. The sleep in, hot shower and cooked breakfast provided a sense of luxury and leisure, and from there it was a case of just wondering what to eat or drink next. I'd cleaned and lubed my bike the night before, and done my washing, so I was free of the burden of responsibility. Lunch was a surprisingly good pizza from Cook o' Burra, which we ate sitting under the verandah of the Burra Hotel. I bought three LP records for a $1 each, and managed to safely stow them on one of the trucks. In the afternoon the weather turned pretty foul, and broke a couple of tents. Judging by the strength of the wind, I think we were lucky that it was only two. Thankfully, the poor weather and high winds were gone by the evening. The first stretch of the Day Seven ride was a lovely sprint out of Burra and towards morning tea at the Russian Molokan cemetery. Once the wind had gotten up though, it was a different matter entirely. The breathtaking, panoramic views of the ranges were soon forgotten as we rode the World's End Highway and climbed into the wind. The leg between Robertstown and Point Pass was particularly tough. Point Pass looked like a bigger place that I would have imagined, and the golden spire of the church stood out for miles. I was happy and relieved to make lunch in Kapunda, where I enjoyed the best roll of the trip. The last section was also quite climby, but we held a pretty good speed and actually quite enjoyed ourselves all the way into Kapunda, our evening destination. Unusually, we didn't see another bike along the whole stretch. We enjoyed a few pints in town, visited the bakery, and I bought a two-dollar 1940 edition of Treasure Island from a second-hand shop. On Saturday, we hit the Mawson for some more off-road hi-jinks. The Kapunda-Tanunda journey is picturesque, and there's some good riding to be had. I think it was the first time on the tour that we stopped specifically to take photographs. We overshot a turn towards the end of the trail (still not sure how - all the markers were clearly visible), but even with the slight detour we were still sitting in Nuriootpa enjoying a coffee and a finger bun at 9.30. It was far too early to end the day's riding, so we planned a route out of town, onto some dirt, and then back onto the Mawson towards Rowland Flat. We passed a few Annual Tour riders on the bitumen heading out; I think they must have thought we were lost or heading the wrong way. I suspect we confused more than a couple of them. It was a stonking good ride. The dirt was a great workout and, once again, the scenery was beautiful. Just before we got back to the highway, I clocked 60 kph on one of the bitumen downhills. Nice. The ride back into Tanunda was uphill, and into the strong wind. Traffic, magpies, and a bumpy shoulder. Not much fun, but a necessary evil. We managed to get to camp in time for lunch without too many dramas. I was expecting a tough day, as the profile and wind forecast were both suggesting hard work. I wasn't disappointed. We packed for the last time, and left camp around 7.30. The expected gentle downhill 30 kilometre run into Gawler seemed anything but. The wind was fierce, blowing us sideways, and there was more than a little climbing, even if it was a nett downhill leg. The five kilometre climb out of Gawler wasn't too gruelling, and the ride along the top had its moments, both good and bad. The wind was another ripper though; probably the stongest yet. The ride into the city along the Linear Path was a relief, notwithstanding the occasional careless dog owner. 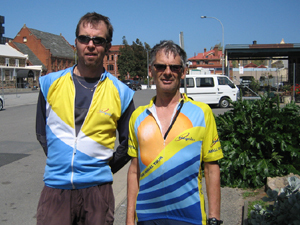 I was delighted to arrive at Bike SA, some nine days after leaving, relatively intact and in good spirits. Lunch, the gathering up of gear and the usual bittersweet farewells were brief. The toughest day of the ride was saved until last, so I definitely earned my Radox bath that afternoon.